Kepware LinkMaster는 OPC Server-to-Server Bridging Software로 다음과 같은 경우에 사용할 수 있다. Input Tag와 Output Tag를 "Drag & Drop" 방식으로 쉽게 연결할 수 있다. HMI (InTouch, iFIX, WinCC, FactoryTalk View등)를 Modbus Slave, IEC60870-5 Slave 등으로 변환하고자 할 때 (Slave function 별도 필요). Primary PC에 이상이 생기면, Secondary PC의 LinkMaster가 자동으로 OPC Bridging 기능을 수행한다. "Drag & Drop" link creation. Supports direct scaling of link item data. LinkMaster's link management system allows you to create a Link database structure that fits the nature of your application. Includes a built in User Manager that allows complete control over what types of functionality each individual user can access. Support for creating Custom Remote Machine references. Includes a stand alone event monitoring application called the EventViewer. 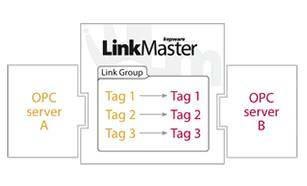 The most common scenario for LinkMaster is to link data between two (or more) OPC Servers. An example might be a customer using RSLinx for connectivity to Allen Bradley PLCs and Kepware's U-CON Protocol Server for connectivity to a checkweigher. In this example the customer wants to easily send scale data to the PLC. 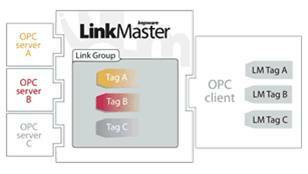 Another interesting application scenario for LinkMaster is to function as a single OPC server which serves data from multiple OPC servers. This approach demonstrates LinkMaster's capability of acting as both a client and server. An example might be when a customer has a single OPC connection available from an OPC client application but multiple OPC servers that they want to acquire data from.